Battery Asking » Cleaning » Best Electric Pressure Washers for Cars (Reviews 2019) – Can pressure washing wear off the paint of my car? Car cleaning is the most dreaded task among many vehicles owners and yet inevitable. It does not only take a hefty part of a busy schedule but also tiring. For these reasons many would rather pay for car-washing services. That is ok, knowing that keeping your car clean is part of maintaining it from being damaged by dirt or grime build up especially on the underneath. But, you can save a lot of your ‘hard-earned cash’ by getting used to doing this task and making it personal responsibility. Fixing time to clean your car can be challenging owing to the fact that you don’t have much time left in between your busy schedule. If that’s the case, you need the quickest means and yet get the best results. Then, the best electric pressure washer for cars should be your solution. Identifying the most suitable unit is another challenge. But, you don’t have to worry about that, we have aligned eight of the best electric pressure washers here below for your quick selection. Stay right here to find out what we have for you. Q: Can pressure washing wear off the paint of my car? Q: Can I use my pressure washer with hot water to clean my car? Q: Can I pressure wash the underneath of my car? Q: Which is the best detergent to use on your pressure washer when vehicle cleaning? Did you identify your best choice of a pressure washer? Sun Joe SPX3000 what opens the conversation on electrical pressure washers. It is a versatile and powerful-performer electrical pressure washer to have among your home tools. The 14.5amp/1800-watt powerful SPX3000 generates PSI up to 2030 with 1.76 GPM for effective cleaning with sufficient water flow rate. Its Total Stop System protects the pump from overuse by shutting off the motor when the trigger is not on. Why we think it is one of the best electric pressure washers to use for your car cleaning is because of its two removable detergent tanks to store detergent for car cleaning. It is a constant cleaner that cleans evenly without leaving out some dirty streaks. With a 34-inch extension spray wand, you will be able to reach its underneath with ease. Also, it has a 35-ft electric cable which will get to your car-washing bay without the need for an extension and 20-ft hose for easy maneuverability. With its four different nozzles for different sprays, it is a versatile pressure washer. The only flaw noted with this pressure washer is the hose connector to the machine which is plastic that after striping its grooves does not close well. Other than that, the device is terrific in performance. Stanley SHP2150 is a unique electric pressure washer for washing vehicles besides other washing uses. The detachable foam cannon ejects soap on to your car to clean out any oily or greasy grime after which you rinse it out to experience excellent clean results. What makes this washer powerful is its ability to generate 2150 PSI water pressure with a flow rate of 1.4 GPM. The modern housing of its 13-Amp motor mounts on two rubber/plastic wheels for easy maneuverability. But, you won’t have to wheel it much since its 25 ft high pressure and a flexible hose with a 35 ft power cable which has GFCI auto-reset plug can extend far and wide. It is a lightweight weighing 26 pounds, and thus you can lift it by its handle and carry it with ease. You can put the pressure washer into other uses if you wish. It has four different types of quick connection (QC) nozzles with a holder for the right pressure output when doing various tasks. However, you will have to be careful to change nozzles for the job at hand since the washer does not have a pressure control system. Annovi Reverberi otherwise known as AR is a product of a 50-year experienced manufacturer of pumps. Therefore it is alright to trust its power and durability and thus the best for your car washing. The AR383SS generates 1900 PSI. Such pressure can reduce your water usage above 80% using a 30-foot high-pressure hose and a 35-foot auto-reset GFCI power cable. It comes with four quick to change different pressure washer nozzles for different washing effects. One of the nozzles is the 40 degrees nozzle which has a broader spray effect ideal for car washing. The other one which is of great interest in car washing is the black nozzle for spraying soap but on low pressure. Annovi Reverberi is safe to use pressure washer which CSA International certify and pass it as safe. It is easy to assemble it with only a few parts to attach which are connecting garden hose, high-pressure hose, the spray and lance. One slight flaw is its pressure fluctuation which is not frequent and therefore not a big deal. It, thus, remains a good choice of pressure washer cleaner for cars. Briggs & Stratton is a household name for the best pressure washers. This time it comes with model 020681 which is electrically powered and generates 2000 PSI with a water flow rate of 1.2 GPM. What makes Briggs & Stratton products to stand out is tough military-grade welded steel frame that can endure any impact. It is a super-quiet pressure washer due to its brushless induction motor which you can use without noise pollution to your family or your neighbors. Washing your car with this washer will then be a breeze considering the smooth operation and but yet effective. The washer effect of your car and the inbuilt detergent tank with the choice of your detergent will make your vehicle washing exciting as you witness your its real color unfold before you. Reaching underneath your car without Briggs & Stratton 020681 would be a nightmare. Once you have this unit, your vehicle will always be clean ‘within and without’ effortlessly. The four nozzle tips provide variant washing effects. For instance, when washing your car, you will need 40 degrees nozzle for broader spray and the soap nozzle which will dispense soap as you wash your car. The unit folds well for better storage as well as to fit in your car boot. However, the only flaw it has is lacking a simple design to spin both the power cable and the pressure hose. If you can innovate your way to tame the wires, the rest of this pressure washer will be a breeze. 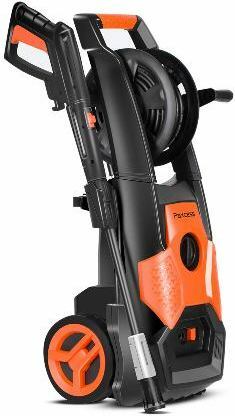 PAXCESS is a powerful pressure washer with an 1800-watt motor with pressure generation of 2150 PSI and water flow rate 1.85 GPM. All these make PAXCESS great for your car washing. The washer has an adjustable nozzles system which enables you to adjust the right nozzle for the task at hand. In this case, where you are looking for the best car washing pressure washer, PAXCESS would be that choice. All you need to do is to adjust to the right nozzle for car washing and incorporate it with the detergent of your choice from the detergent tank. That way, you will have the best car cleaning experience with exciting results. It can’t be complete without that 33-foot power cord and the 26-foot high-pressure hose both long enough to take you to your place of car washing. You won’t need an extension or to drag your washer with you because both lengths are enough. The washer features a Total Stop System that protects its pump from overheating and probably breaking down. The pump shuts off whenever the trigger is operating. The unit has a hose reel that reels the unneeded hose length. But, the power cable doesn’t have somewhere to coil it. You will have to bundle it on a hook which becomes a mess. PAXCESS pressure washer is easy to assemble. However, the problem with this washer is the garden hose which leaks at the attachment. It also gets stuck making it difficult to unscrew it when done with washing. Stanley SLP 2050 has a powerful cleaning force of 2050 PSI and water flow of 1.4 GPM which makes it the best for car washing. You will not have to wash your car using your garden hose anymore and take ages to complete the task. The washer sits on a mobile cart with two back-wheels to roll it to your working location. You can remove it from the cart to use it as a standalone for portability. It features a compact tri-axial pump which makes the pressure washer a light unit. Starting the washer is easy by using a push-button switch which makes using it easy and comfortable. Unlike other competitions in the market that have problems with a garden hose connection, Stanley SLP 2050 has leak-proof brass connections. The 25-foot hose is flexible and soft which connects easily with nozzles. It comes with standard nozzles which are 0, 15, 25 degrees, soap, and rotary. For car wash, 40 one and the solvent is what you will use for better cleaning results. The one downside which we noted is that it is the heaviest and the priciest of other Stanley models weighing 36 lb and no wonder it has a cart to wheel it around. Other than that, it would be the best choice. SPX3000 is another Sun Joe model that we have included in this review for its offer in service. It provides you with three different cleaning jobs, light, medium, and heavy duty. It has a 14.5-amp/1800-watt powerful motor that generates 2030 PSI and 1.76 GPM water flow. This powerful pressure washer is the perfect one for your car washing chore that will make it not only comfortable but exciting. It comes with five quick to connect spray nozzles for different tasks which are 0, 15, 25, 40, and soap. For your car washing, you will need 40 which sprays out water and the soap one for best cleaning effect. The pump is well protected to prolong its life by Total Stop System (TSS) which shuts off the motor automatically when the trigger is not set. With SPX3000 you have an option of using two different detergents because it has two 0.9 liters removable tanks for powerful cleaning effect in your different cleaning tasks. Other features are a 35-foot power cable, 20-foot high-pressure hose, a spray wand with a trigger, and two big wheels for easy wheeling the unit around. SPX3000 is the perfect choice for your car washing but, it has a slight flaw. It is the shallow threads on the hose at the connection which makes it leak a bit. Other than that, go for it. It’s a tremendously powerful washer. Power NXG is a high power pressure washer with a 14.5amp motor which has the latest technology of non-brush induction. It generates 2200 PSI with a water flow rate of 1.76 GPM. The power in this unit can effectively wash your car with the right pressure as well as tackle other regular cleaning jobs. The induction motor adjusts its heat generation and does not require much current to generate higher power than most brushed motors. It uses 30-foot long power cable that can extend your washer as far as you need and a 20-foot high-pressure hose that increases the washing distance as well. The washer has a TSS (Total Stop System) which with the help of a microswitch it senses the water flow to the pump. The system therefore automatically stops the motor from running when there is no water flow protecting the pump from overheating. Power NXG pressure washer does not pollute noise since it has a low sound which is ideal to use in an adjacent neighborhood. It works with different quick to change nozzles from its release spindle for various tasks including car washing. The pressure washer lacks turbo nozzle which is its downside. You can’t damage your car paint when using a pressure washer to clean it. What you should be careful about is using the right nozzle for proper water pressure. Select a nozzle tip with a broader spray that has less water pressure but cleans effectively. No, it is not right since most electric pressure washers are designed to use cold water. Running hot water through your pressure washer can cause damage to your washer’s pump. However, if you have to use hot water, there are some washers which are specially constructed to use hot water. Your vehicle’s underneath where the engine lies can have a heavy coat and a buildup of dirty oil as well as grime that can contrast with its body which gets frequent cleaning. It is vital to care for the underneath of your car as you care for its body by washing it using a pressure washer. However, be careful to seal all the electrical parts which can be affected by water using a plastic wrap. If you can’t do it on your own, take it to a professional car washer. But make sure it gets the treatment as the other parts of the vehicle. Not all detergent and soaps can work in a pressure washer. You might not realize the right ratio of water to detergent and therefore fail to clean it effectively. Check out for the proper pressure washer detergents that are well concentrated on reaching the right foam for vehicle washing. By now, you are well informed on most facts regarding electric pressure washer for car washing. You will agree with us and without a doubt that electric pressure washers for car washing are the best way to achieve good results. Washing your vehicle is one way of maintaining it and therefore extending its life. Do not keep your wand down. Keep your car clean at all times. Tell us about it in the comments section reserved for you here below.